Howdy everyone! Been awhile I know. Truth is this month has been unbelievably busy… hell, for that matter the last two months have been burning at both ends. The summer months are usually filled with keeping the acreage under control and now with trails added to the running circuit my remaining evenings and weekends are spent on the hills or in the gym. Also thought it was time to give my other blog some love so cranked out a few posts over there to keep their hate mail down. Figured I’d go ahead and throw a post out there to get back in the groove. Technically, this is not a new bird to the blog and definitely not a new check in my birding list. Nope, this colorful bird has been showing up here at random times since 2008 usually as part of a broader bird collection post or a side find while out birding Jubilee State Park or other nearby birding hotspots. 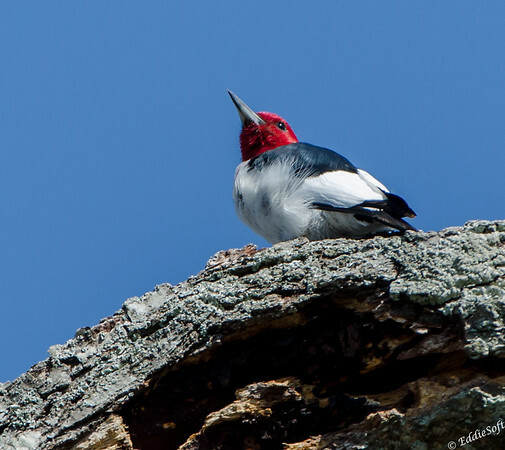 Today, the mature male Red-Headed Woodpecker gets a post all to itself to show off those brilliant colors. Hit the jump to see a few more shots of this pretty bird. This fine specimen comes courtesy of a birding trip Linda and I took back in April 2015. Yeah, I know it was a few years ago, but I’ve been feasting on all the finds from the recent Texas trips and unfortunately letting my queue grow long in the teeth. You will probably be seeing a lot of my older stuff as I try to get that back under control…wondering if anything in my life is under control at the moment. So this cute specimen was found while we were hiking around Kentucky Lake. 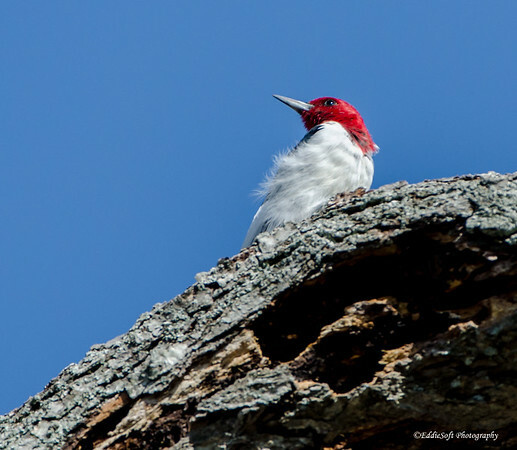 One of those days where the deep blue cloudless sky worked in my favor as it contrasted nicely against the bright reds and whites that adorn this dagger wielding Pecker. 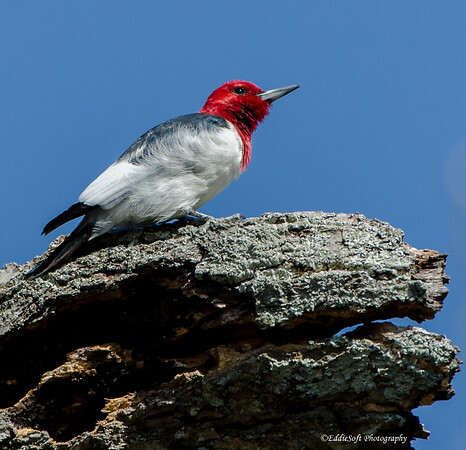 Up until the last two years, the Red-Headed Woodpecker was considered a special treat whenever we came upon it out in the field. Their sightings were fairly rare around here with one making an occasional appearance as it passed through the forest assessing the various dead trees for juicy bugs. 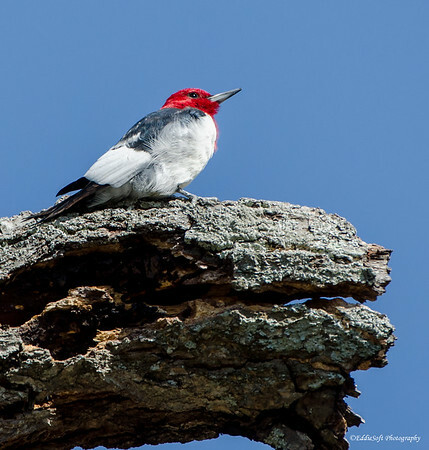 The Downies and the Red-Bellied Woodpeckers were the more dominant tree bangers in the area. For some reason there has been a bit of a swap the last two years. 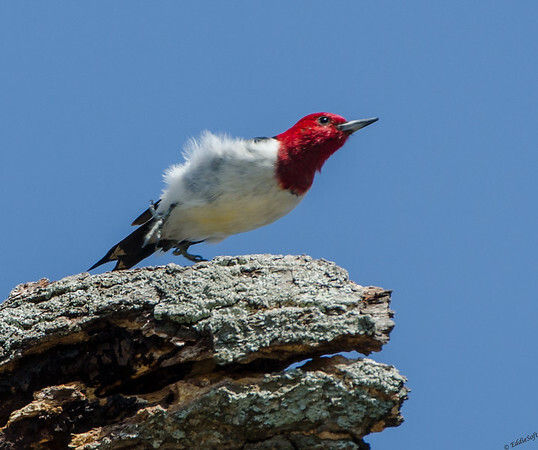 The Downies and Red-Bellies have become less abundant – still around but maybe only one or two specimens flying through the backyard at a time playing a bird version of tag or eyeing the sunflowers in our feeders. In contrast, the Red-Heads have exploded around me to the point it is odd when I do not see one at some point in the day… and it isn’t just around here. Seems like every trip I take I see more and more of them. South of us, North of us, West and even East, there they are. It is quite possible that I am just more observant that I used to be, possibly, but not likely. I honestly think the Red-head is in some form of resurgence. Anybody out there having a similar experience? To be honest, there is a bit of redemption with this post. In a recent talk I gave at a local chapter of the Audobon Society, I brought up the point that a blog is a perfect medium to to mark your progression in an interest. In my case, wildlife photography… in particular the feathered kind (as you are aware) has been a primary topic since I started my blogs over 10 years ago. Essentially I have a decade of reference materials documenting my photography journey. Still have a loooooooong way to go and more areas of improvement than I care to admit, but it is nice to see some improvement over those early days. Take for instance my first post on the juvenile version of this particular species. I played the semantics game a bit earlier when I said this was the first featured post – my previous version focused on the juvenile which I was unable to identify at the time. That post was back in May 2008 (link here). Wow, were those some bad shots hehehe. As a well known photographer routinely states – one fuzzy one is a mistake – a whole bunch of them is a “style”! Nice to know there is at least some improvement – of course, better equipment never hurts. Anyway, time to call it a night. The pillow is calling and it’s up early again tomorrow for another full day. Stay cool everyone, and see you again real soon now. Ahhh. Nice to be back to my routine of having my morning cup of coffee and reading and looking at your bird finds. I am starting to feel a backlog as well. Dealing with way to much on the plate and something falls through the cracks. I have 3 unfinished blogs in my draft box and several that haven’t been written but the trips have been completed. Maybe my winter work? Look forward to your next blog. Hopefully you will never get to my backlog point – I crested over the three year backlog this year and that is weighing heavy on me – of course I said that last year when I was still around 2 years in my queue. The only thing that saves me is I was blessed with a fairly decent memory so I can pretty much recall most of the details of the events where I took the pictures. Now, I also have to deal with my brother (see below) who is always pointing out how much of a slacker I am which forces me to hit my monthly post quota. Hopefully, like me, when you do get around to the post (depending on the topic of course), it brings back good memories. I’ll try to get something out here again pretty quick – have two more posts to go on my other blog and then I should have some runway to get a bunch put out here. Thanks for stopping by and glad I could give you something to read to start your day – happy blogging! I agree—maybe it’s me, but I’m seeing more of these than ever. And they are beautiful, as are your shots here! The colors are magnificent, and as you say the blue sky is a perfect red-white-blue combo with a little black thrown in. 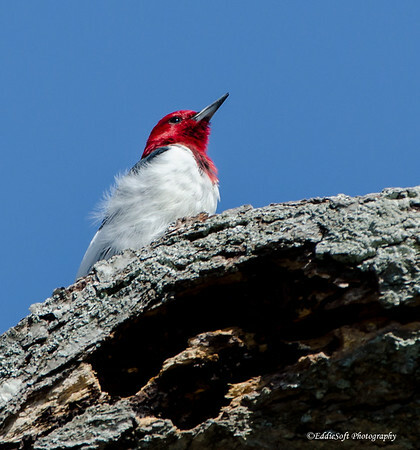 Looking at your 2008 post of the juvenile Red-Headed Woodpecker, I would say that you did have a style different from your style today. More of an impressionistic style. But I have never seen a juvenile, so it was interesting to see how different they look. 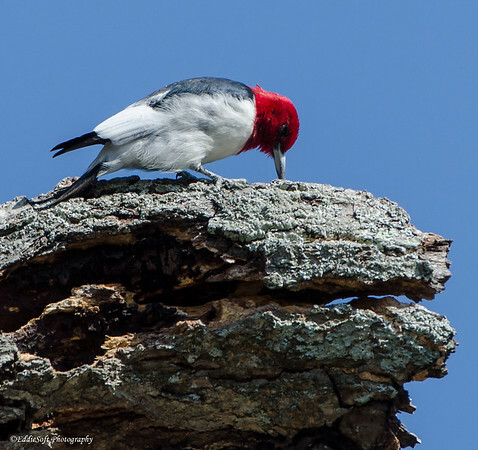 For me it is always fun to see a Red-headed woodpecker! Thanks for sharing it with us! Great sequence of shots Brian, like you I’ve noticed a huge improvement in my photography. Instead of being in a rush to nail a shot tend to take my time and get a feel for the subject. Thanks! I still panic a bit when I come upon a new bird – worried it will high tail it out of there before I get it in the tin, but for those birds I do have I’ve been trying trying to enjoy the moment and take into account the light and background more. Still plenty of room for improvement – I get jealous every time I stop by your site and see another stunner! Yes something new and the nerves kick in. Beautiful bird. Thanks for sharing.